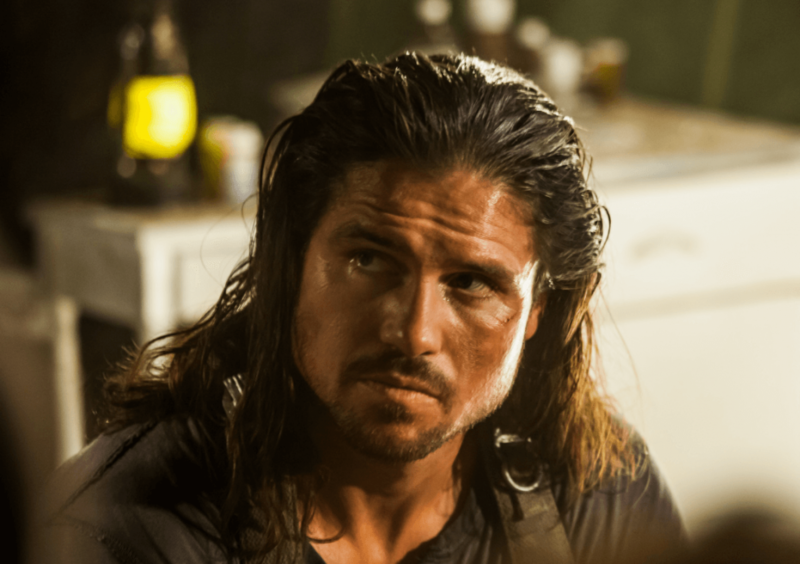 For all you John Hennigan fans out there I’ve got some good news. 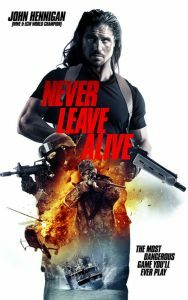 Wild Eye Releasing has a new action flick out called Never Leave Alive (2017) starring John Hennigan, which came out on VOD (video on demand) November 7th. Never Leave Alive was released in April 2017 and was originally called The Most Dangerous Game. I liked the idea of Never Leave Alive and for the most part, it’s a good movie. The action side of the story reminded me of Surviving the Game (1994) starring Ice-T and Rutger Hauer with bits of Romancing the Stone (1984) starring Michael Douglas and Kathleen Turner due to the relationship between the main characters Rick and Anna. I liked the Romancing the Stone aspect of the story, Rick and Anna’s interactions help lighten the constant dread and doom feeling that the action side of the story brings. My problem with the story is that Rick starts out being a drunk. His fame has gotten to his head and it’s affected his level of professionalism, I’m ok with that. It’s the drinking part that gets me because the opening of the movie leans on his drinking problem, but then disappears when it’s inconvenient to the story. He could have just been a raging celebrity a-hole that lightens up later and everything would’ve still played out the same. Now, I liked what Sabater did with the character Anna, she’s a strong solid character. Yeah, she’s got a past that has left some scars, but it makes her a fighter, not a follower. It was nice to see a female holding her own and not just looking to be saved as everything was going down. In the world of action films, the story is solid and I liked the characters, even the bad guys. The playthrough was ok. One of the problems I had with the movie is with only two people being hunted things felt slow and somewhat drawn out at times. If there were more people being hunted it would have broken up the dead spaces a bit and giving the “bad guys” more to do in the movie. Think about it, a big deserted island and only four people (in teams of two) running around on it. Yeah, the traps help add some suspense to the film, but there’s a lot of walking with no feeling of danger in the movie. I will say, I thought the fight scenes looked good.Even though I’m not a fan of the shaky camera work style, I get why everyone uses it for the action scenes, it helps the audience feel like they’re in the fight, but I’m a fan of pulling back so you can see what’s going on in the scene. Never Leave Alive uses the shaky camera style for the entire movie, so you’re always feeling like you’re right there with the characters. 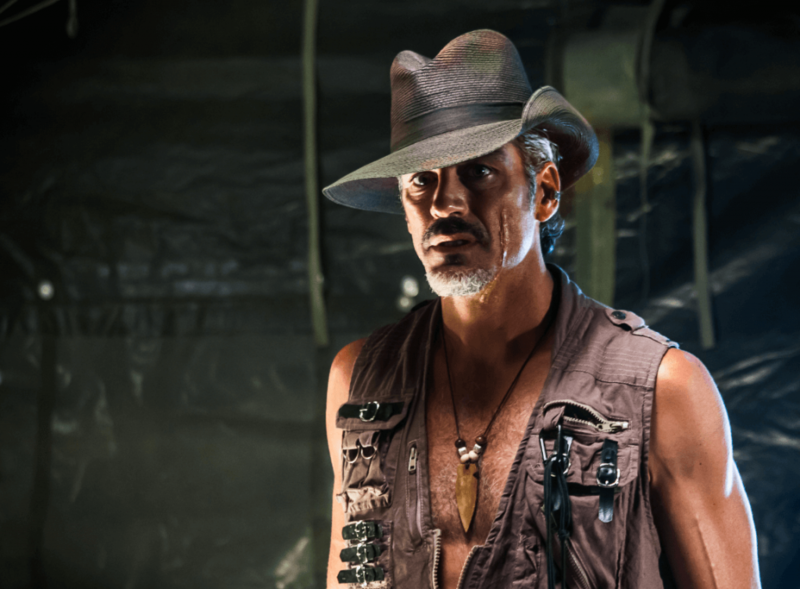 Some of the cast is John Hennigan (Hercules Reborn), Michelle Taylor (Dark Amazon), J. Michael Evans (Criminal Minds: Beyond Borders), Joseph Gatt (Game of Thrones), Alistair McKenzie (Falling Up) and Eric Etebari (The Lincoln Lawyer). The movie centers around Hennigan, Taylor, Gatt, and Etebari. Overall, I thought everyone did a good. Hennigan’s acting is a little rough, but you can see a lot of potential there. I think as time goes on he’ll be a great addition to any film. The special effects were a hit n miss with me. The practical effects looked really good, but the scenes with CGI stood out and didn’t blend in with the scene. Summary : It was a good movie, but a few tweaks and it could have been better. It's rated UR (unrated) but has violence.